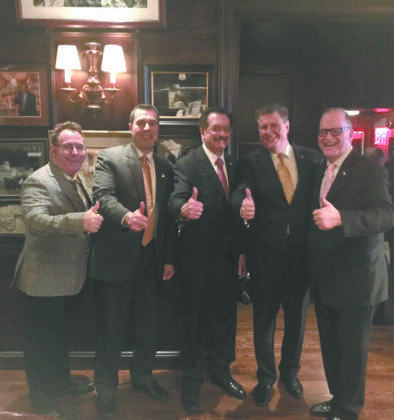 AHEPA’s Historic Manhattan-based Chapter, Delphi #25, Initiates 37 New Members thus becoming the Largest Chapter in the entire AHEPA global domain! [New York, NY] — Thirty-seven Greek-Americans and Philhellenes were initiated into the historic Delphi #25 chapter of the Order of AHEPA at Gallagher’s Steakhouse in Manhattan on January 23, 2019, and the Chapter achieved the position of “The Largest Chapter in the AHEPA global domain”! This remarkable achievement was attained after a dynamic three-year revitalization path under the new administration and the lead of its current President Brother Louis Katsos (who also serves as Lt. Governor of the AHEPA Empire State District Six). The Delphi Chapter # 25 was founded in NYC in 1923 and is one of the most storied chapters in the history of the international fraternal organization with many esteemed past and current members including the late Fraklin D. Roosevelt (FDR), President of the USA. Befitting this historical event was the attendance of the Supreme Vice President Brother Jimmy Kokotas who recognized the Chapter’s many accolades and announced the position attained by Delphi Chapter # 25. 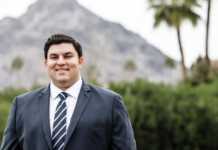 Past Supreme President and Member of the Board of Trustees, Brother Andrew C. Zachariades was also in attendance and was beaming with pride as he has always been a staunch supporter of all the Chapter’s many events and initiatives. Governor of District 6 Brother Demi Pamboukes spoke of the Chapter’s many endeavors in espousing and promoting Hellenism (Chapter President, Brother Lou Katsos, also serves as Vice – Chairman of the National AHEPA Hellenic Cultural Committee) and also expounded on some of AHEPA’s Scholarship programs and its AHEPA Journey to Greece educational and cultural program for youth. The event was also well attended by many other current and past members of AHEPA’s hierarchy and several Presidents from other local Chapters as well as the Director of Hellenism of Chapter HJ-1 from Athens, Greece Brother Takis Karamoutsos. 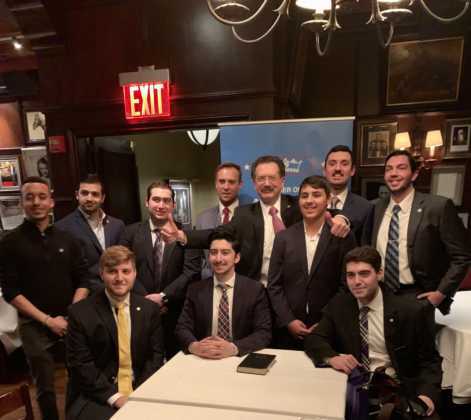 During the event, it was further announced that the Sons of Pericles New Renaissance Chapter #5 (which was originally founded in 1930 and is part of the Manhattan AHEPA Delphi Chapter # 25 family) was reactivated with 12 new members in attendance. The Chapter was reactivated on November 13, 2018, with the help of SOP Supreme Secretary Brother Paul Pavlakos and Past SOP Supreme President Andreas Christou (both current members of Delphi 25). Left to Right: Basil Katsamakis, Chapter Secretary; Louis Katsos, Chapter President; Andrew Zachariades, Past Supreme President; Jimmy Kokotas, Supreme Vice President; Demi Pamboukes, District Governor; Dean Moskos, District Treasurer; Michael Papaphotes, Past District Governor and Past President of Delphi 25. Left to Right: Chris Karis, Chapter Treasurer; Basil Katsamakis, Chapter Secretary; Louis Katsos, Chapter President, Jimmy Kokotas, Supreme Vice President; Andrew Zachariades, Past Supreme President; Demi Pamboukes, District Governor. Father Vasilios Bassakyros cutting the Vasilopita; Demi Pamboukes, District Governor ; Dean Moskos, District Treasurer; Theodore Klingos, Chapter Vice President. Louis Katsos, Chapter President ; Paul Pavlakos , Supreme Secretary Sons of Pericles ; and Andreas Christou, Past Supreme President of Sons of Pericles flanked by the members of New Renaissance SOP Chapter # 5. 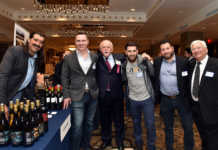 Left to Right: Michael Papahotes, Past District Governor and Chapter President; Jimmy Kokotas, Supreme Vice President; Louis Katsos, Chapter President; Takis Karamoutsos, Director of Hellenism Chapter HJ1 Athens; Argyris S. Argitakos , Past Chapter President. All the new Initiates, Delphi 25 and Sons of Pericles 5, were surrounded by banners and placards presenting the historical figures of Delphi 25 and the Hellenic and American values of the organization, which were reflected in the oath they took, the Greek and American national anthems, and the invocation offered by Very Rev. Archimandrite Vasilios Bassakyros, Presiding Priest at the St. John the Baptist Greek Orthodox Church located in Gramercy Park Manhattan. The Initiation Oath was administered by the Supreme Vice President Brother Jimmy Kokotas who also hails from New York City. At the appointed time the new Initiates were escorted to the front of the room, they were then asked to place their left hands on the shoulders of their fellow recruits and to raise their right hands and were administered the oath of The Order of AHEPA. The Annual Delphi Chapter Vasilopita cutting event is dedicated to the memory of the late James A. Poll (1920-2013), who had served The Order in many capacities most notably Past Supreme Secretary, Past Chairman of AHEPA’s Saint Basil Academy (In its 97+ year history, the AHEPA family has donated more than $1.75 million to the Saint Basil Academy for the construction and ongoing maintenance of its facilities) as well as Past President of Delphi Chapter # 25. Dean Poll, son of James Poll and a member of Delphi 25, is the owner of Gallagher’s Steakhouse in NYC and hosted the event.